There are shows with storytelling, and then there’s storytelling…with a beat. Audiences joined Snap Judgment host Glynn Washington and KPCC In Person on Saturday, November 17, at The Theatre at Ace Hotel. We brought a live taping of the hit WNYC Studios show that has been electrifying audiences nationwide since 2010. 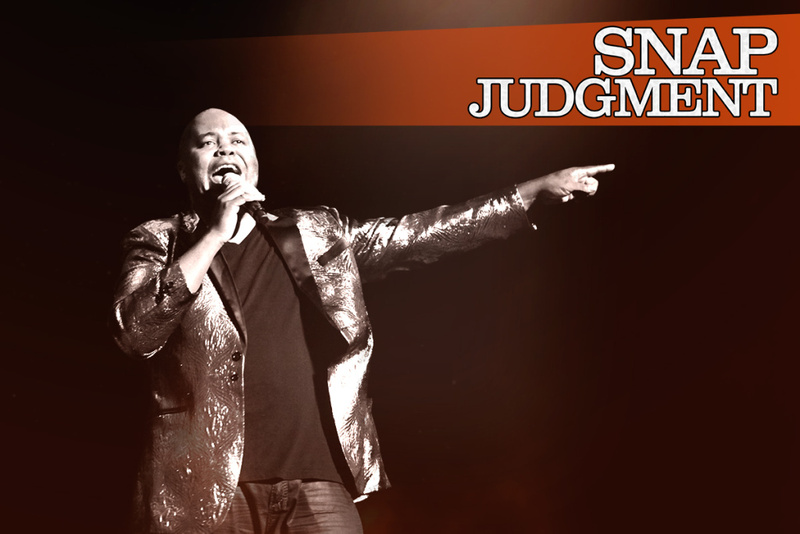 Snap Judgment's stage show dares audience members to see the world through another’s eyes. It features the world’s finest storytellers delivering raw, compelling stories backed by music from the Snap Judgment band. You'll laugh, you'll cry, and you'll laugh some more. Glynn Washington is the host and creator of “Snap Judgment” and has worked as an educator, diplomat, community activist, actor, political strategist, fist-shaker, mountain-hollerer, and foot stomper. Don Reed is a former “Snap Judgment” storyteller of the year, and a comedian, producer, writer who has been featured on the “Tonight Show,” Pop-Up Magazine, and the Lin-Manuel Miranda series, "Bartett." Jen Kober was the 2016 Winner of WNYC's “Snap Judgment” comedic performance of the year for her Girl Scout Cookie story, which goes viral again every Girl Scout Cookie season. Katie Leavitt draws from a rich storytelling stew of time spent as social worker, an activist, and a comic. Dino Archie is a writer, actor, and comic. He won first place in the Seattle International Comedy Competition and has appeared regularly on Comedy Central. Bells Atlas, band extraordinaire, emerges from the vibrant cultural and musical backdrop of Oakland. Combining heavy rhythm, soulful vocal harmonies and a healthy dose of wildcard energy, this dynamic group created a sound uniquely their own. Bells captures eclectic influences – soul, West African and Brazilian rhythm, noise pop, psychedelia – and makes a special kind of magic. This event may include strong language and may not be suitable for all ages. Parental discretion is advised. Please e-mail events@kpcc.org if you have any questions. Tune in to Snap Judgment weekly on 89.3 KPCC (Saturdays at 4pm). WNYC Studios' Snap Judgment is heard weekly on over 400 public radios stations, and downloaded over two million times a month.